Books have been written about the 1996 Mount Everest disaster. Like, six of them. Including John Krakauer’s bestselling, first-hand account Into Thin Air. Throw in the made-for-TV movie, a couple documentaries and countless articles, and you may start to wonder: what’s left to say about the tragic collision of human error and meteorological brutality that claimed the lives of five climbers and three border policeman on the world’s tallest (non-oceanic) mountain 20 years ago this May? According to Director Baltasar Kormákur’s (2 GUNS) EVEREST, nuthin’… but that doesn’t mean there isn’t still plenty to show. With an effective pairing of gorgeous, harrowing cinematic spectacle and tense, tearful Hollywood melodrama, Kormákur’s film offers a thrilling and largely respectful step-by-step dramatization of 1996’s well-known tragedy. ‘96 marked the five-year anniversary of professional climber Rob Hall’s (Jason Clarke) fledgling business, Adventure Consultants – an extreme tourism company that specialized in guiding deep-pocketed amateur climbers, like brash physician Dock Weathers (Josh Brolin), determined mailman Doug Hansen (John Hawkes), and stoic journalist John Krakauer (Michael Kelly), up some of the most treacherous mountains on Earth. Adventure Consultants’ whiz-bang first season on Everest in 1994 convinced other expedition mongers, including Mountain Madness founder Scott Fischer (Jake Gyllenhaal), that Nepal’s hills were alive with the smell of money. By 1996, Everest and the surrounding glacier were bottle-necked with paying experience junkies and their attendant, hand-holding dealers, leading to dangerous over-crowding on already perilous cliffs. EVEREST wastes no time in getting Hall, Weathers, Hansen and the rest of the crew onto the mountain, where, from the bustling purgatory of base camp, Kormákur provides a first dizzying, skyward glimpse of the ice-choked hell looming above. After meeting Adventure Consultants’ base camp support, Helen Wilton (Emily Mortimer) and Dr. Caroline Mackenzie (Elizabeth Debicki), the team begins their grueling trek. 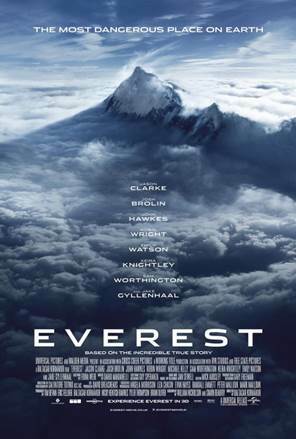 Towering ice walls; rattling, crevasse-spanning ladders; the empty dark of glacial chasms; the pummeling winds of the eventual storm; and the dreadful silence that follows are all reasons to see EVEREST in the theater. Not only is much of Kormákur’s location-shot footage gorgeous to look at, but also, the way in which he paces the onset and severity of volatile weather provides a brutal, unexpected severing of tension that’s truly exciting to experience. Over the course of EVEREST’s mostly brusque two-hour run, screenwriters and bio-drama veterans William Nicholson (MANDELA: LONG WALK TO FREEDOM) and Simon Beaufoy (127 HOURS) are content to let Kormákur’s enthralling crane-swooping, cliff-hanging camerawork dwarf the characters into digestible archetypes playing everything – from Rob Hall’s paternal, peewee soccer coach encouragement to Doug Hansen’s clear-eyed, all-in naiveté and Scott Fischer’s discontented, over-confident hunger for new frontiers – straight from their hearts. These versions of the story would be more complex and, in some ways, more satisfying – diagramming a disaster for identifiable past failures instills confidence in the preventability of future failures. But they also wouldn’t be nearly as thrilling. And I mean that seriously. It’s a tricky notion – corralling the sprawling chaos of real-life tragedy and its haunting echoes into neat, market-ready matinee spectacle. I’m not generally one to revel in the diminishment, simplification or sensationalization of a story like this. And, though it never quite engages with the raw and fleshy moral nuance of its characters or their situations, it nudges at the complexity of both its victims and survivors enough to leave the thoughtful viewer shaken and hungry for bigger answers. Fortunately, as I said, like six books have been written about the 1996 Mount Everest disaster. There have been articles and documentaries made by journalists, primarily looking to dissect and parse and diagram and explore. To point fingers and allege preventable failures.